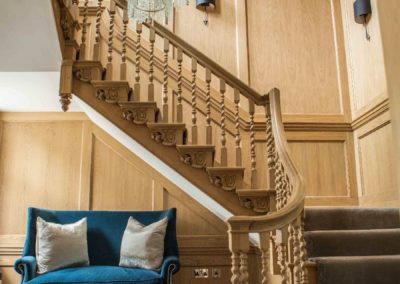 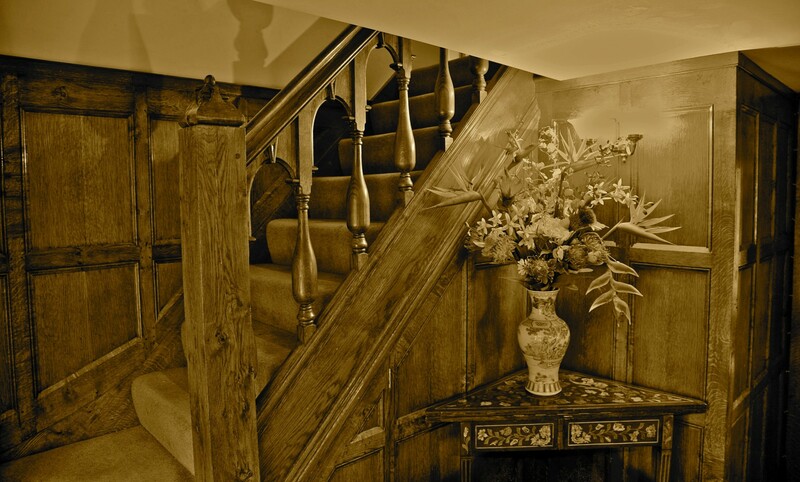 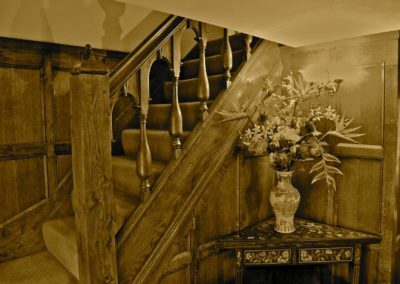 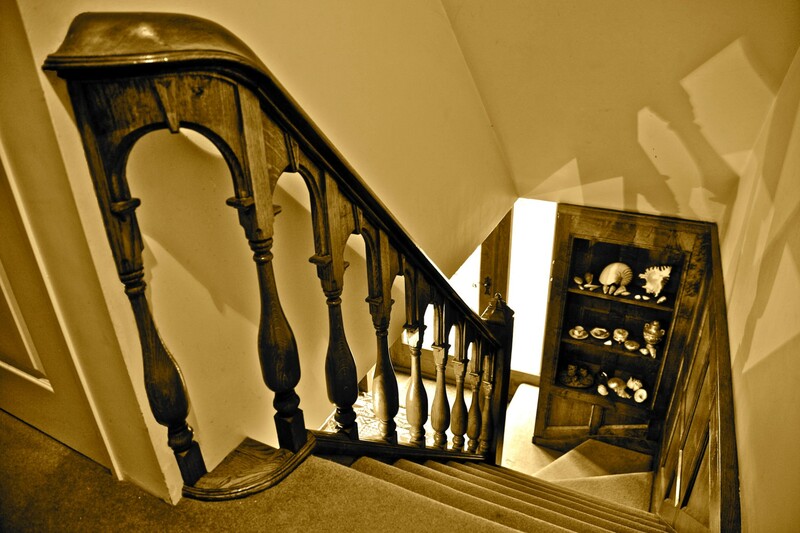 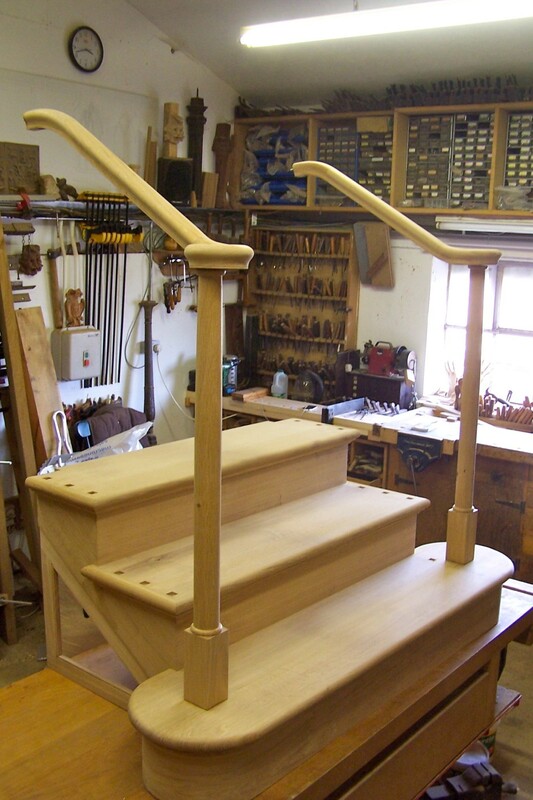 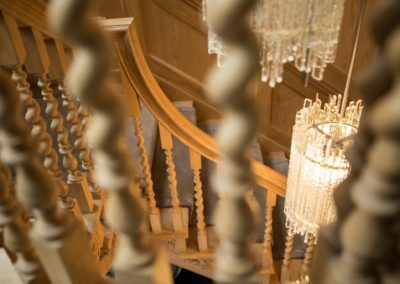 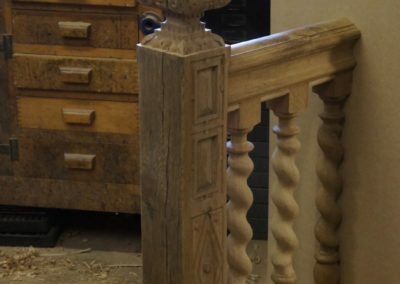 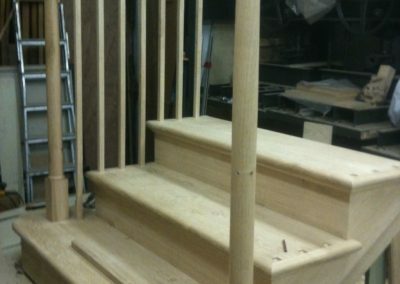 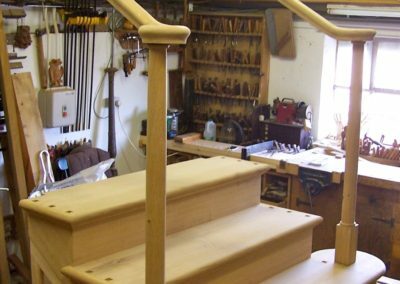 We have made a variety of wooden staircases, from Early Period , Queen Anne , Georgian , Victorian to contemporary. 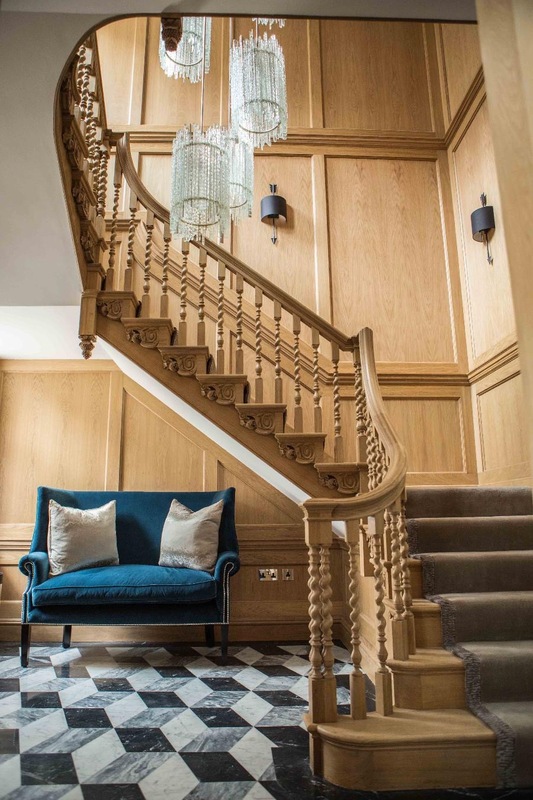 We were lucky enough to be commissioned to produce the missing Queen Anne staircase on a Grade 1 listed, Queen Anne house in London SW1. 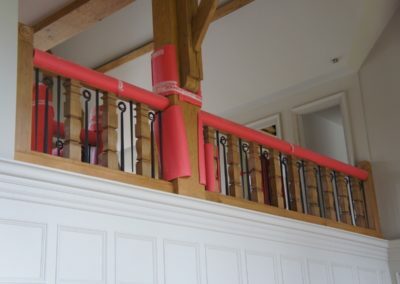 The original case had been removed in the 1970’s and the stairwell joisted over to gain extra office space with in the building. 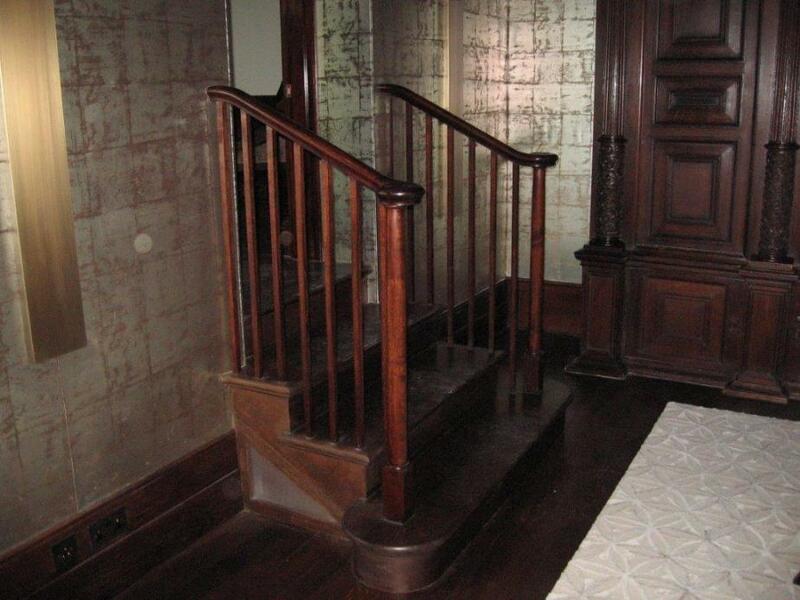 Access to the different floors were served by what was originally staff servant stairs at back of house. 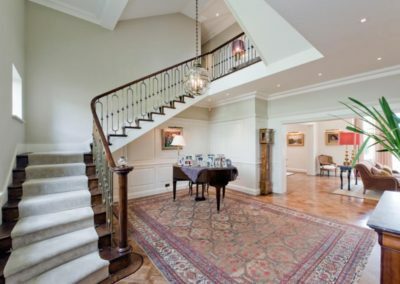 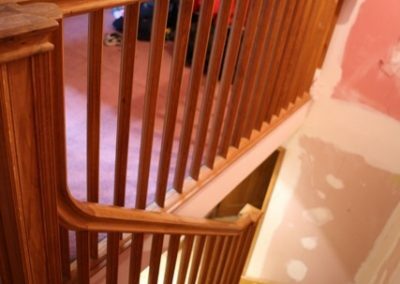 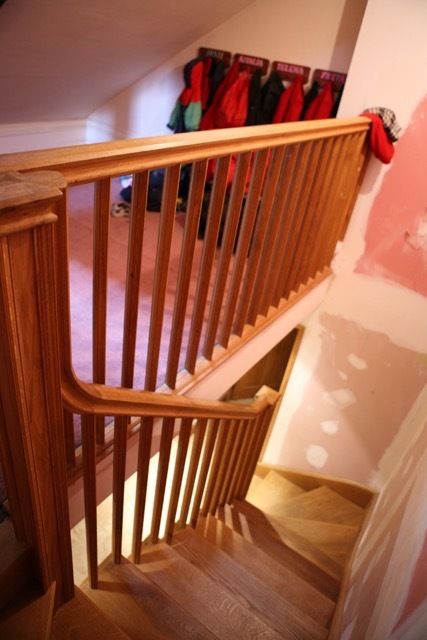 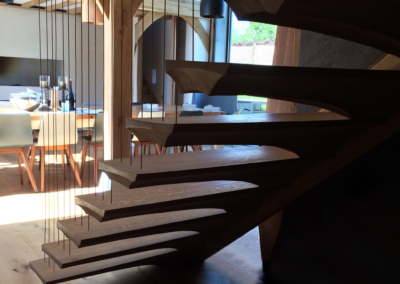 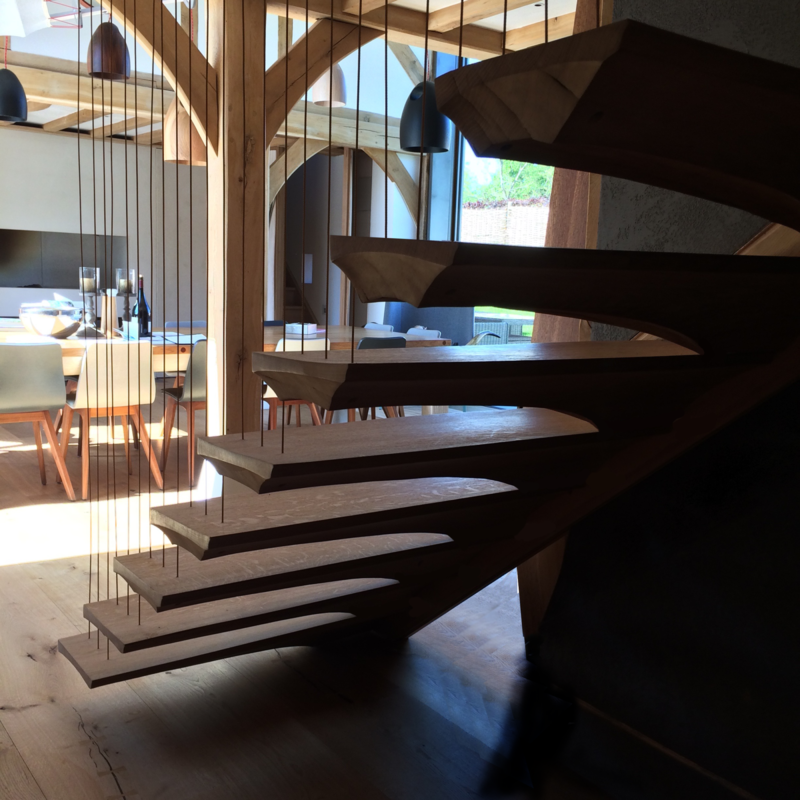 In order to gain planning consent, one of the stipulations was reinstall a new staircase as the original. 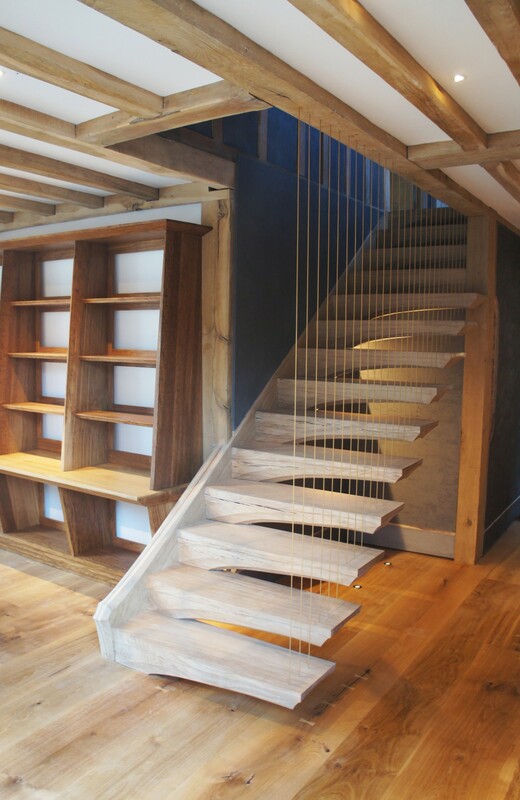 The architect and client wanted hand-worked craftsmanship, charm and soul. 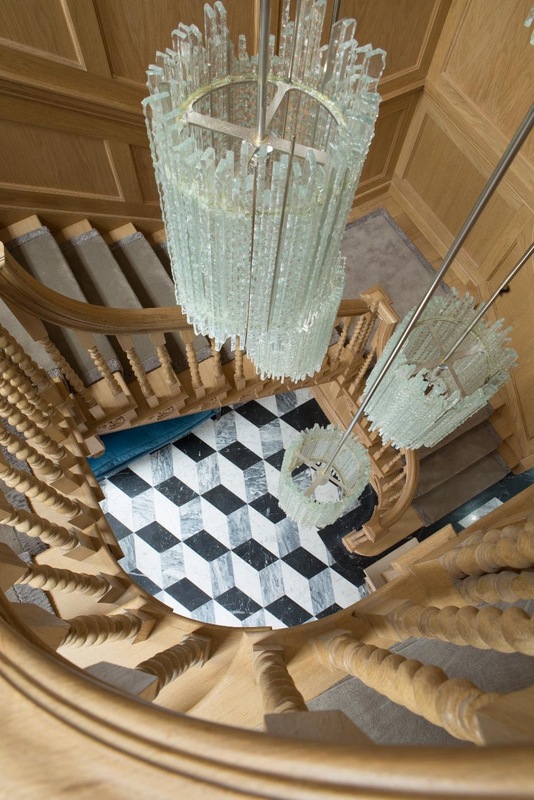 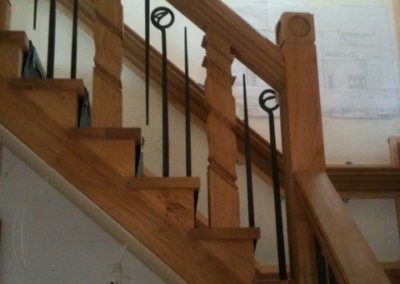 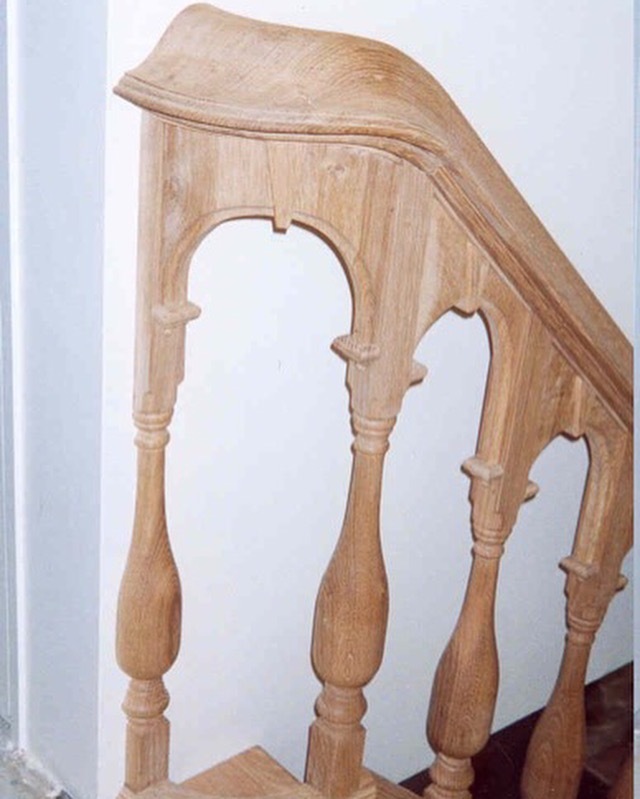 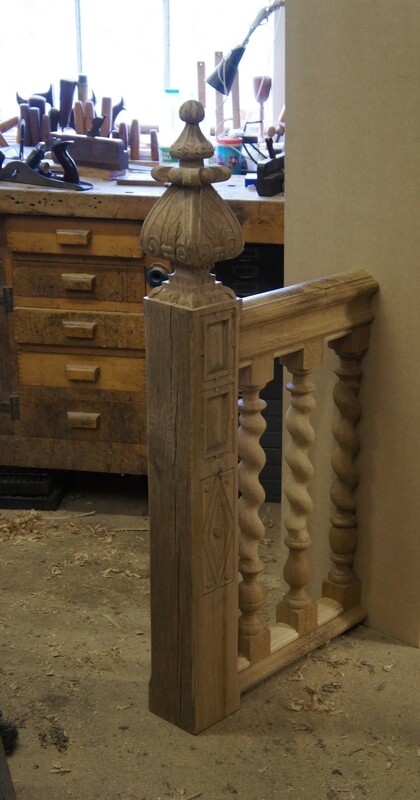 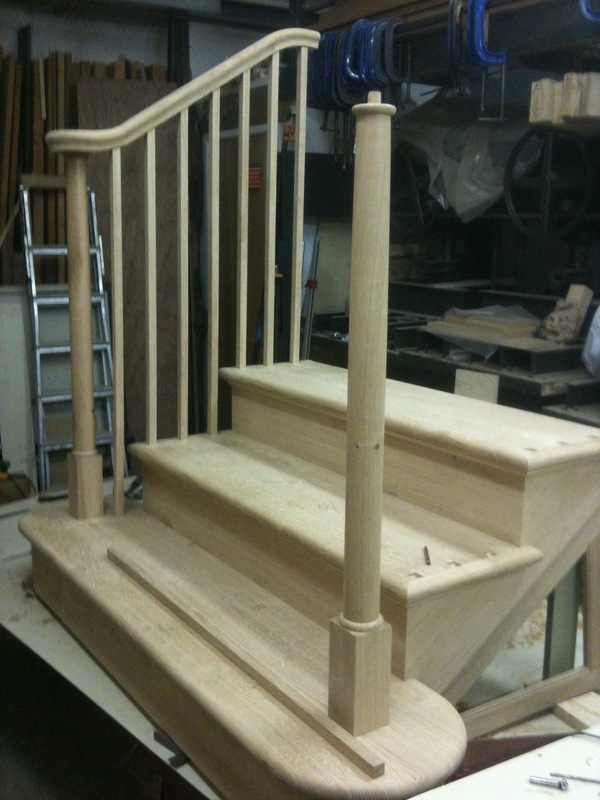 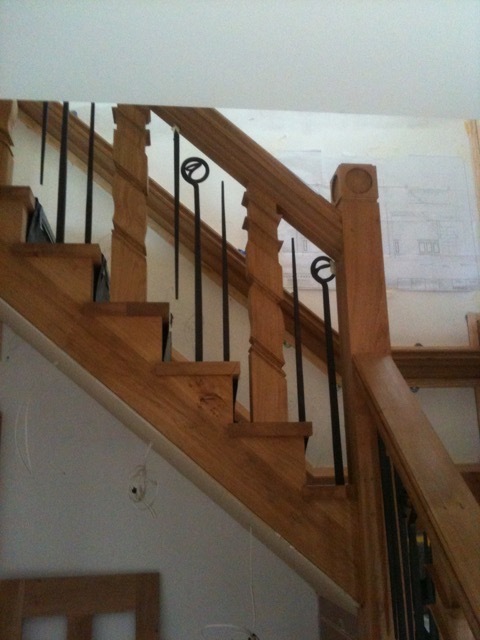 the raked spindles were used on the rise of the staircase, the remaining were used on the gallery landings. 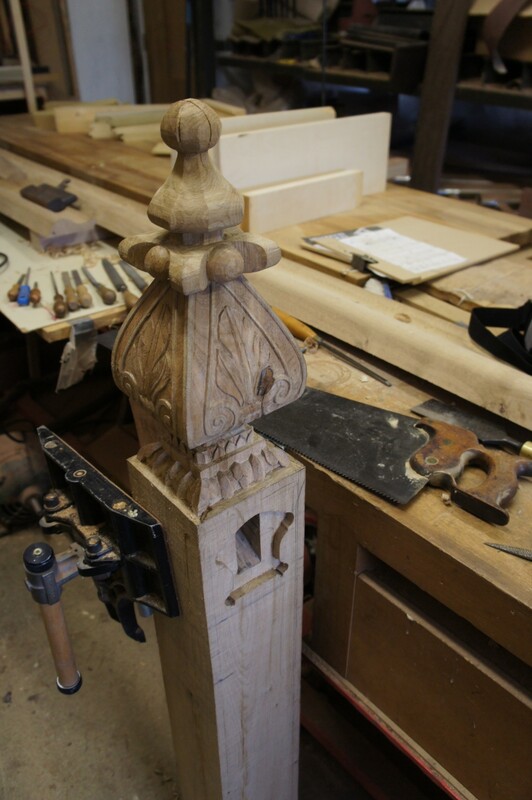 Also a close up of the 40 Tudor roses that were carved for the project . 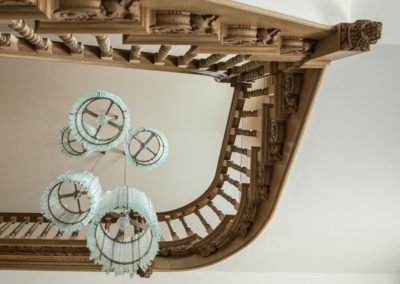 The cantilever staircase was a design solution that echoed the buildings historic construction methods and fulfilled one of the many crafted items on S A Spooner’s bucket list of fun projects. 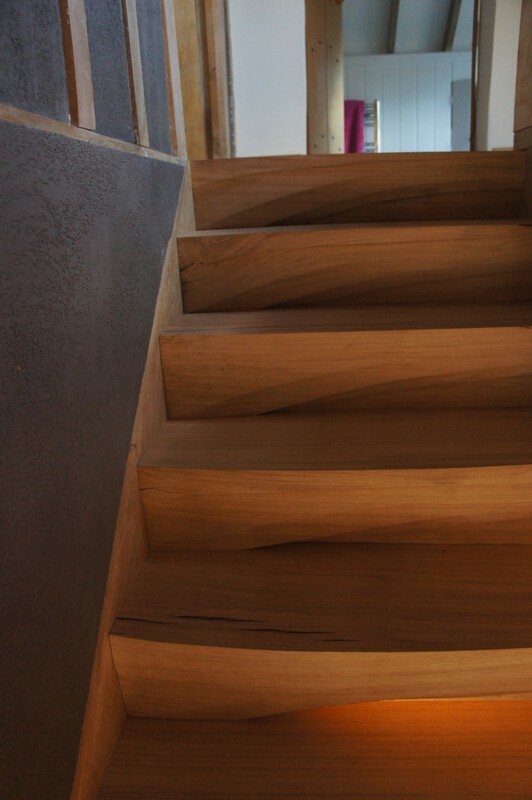 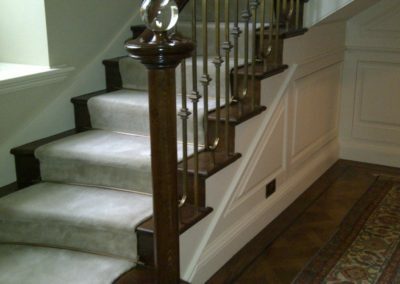 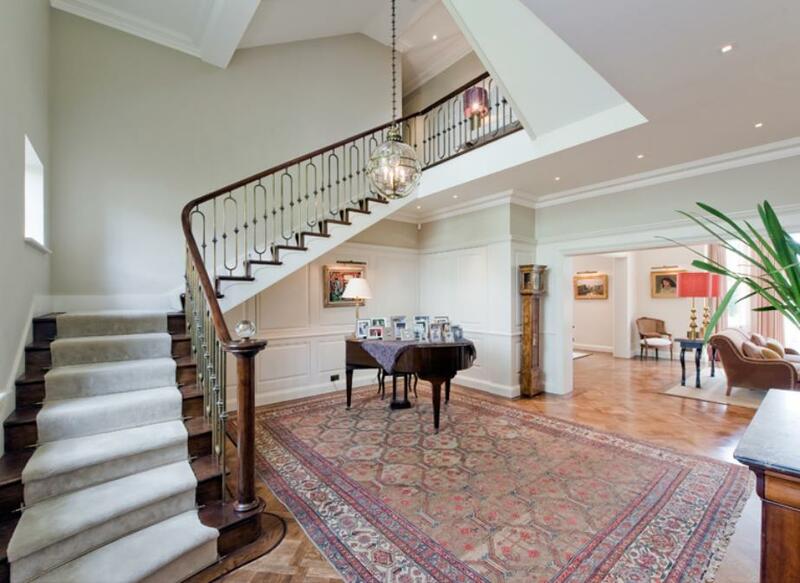 The Sculpted staircase was a commission and addition to a larger home conversion remodel contract. 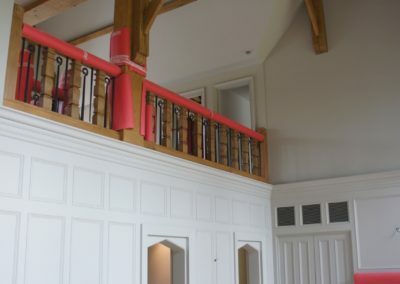 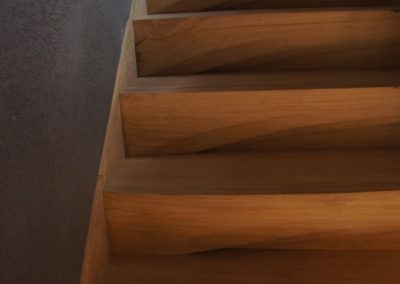 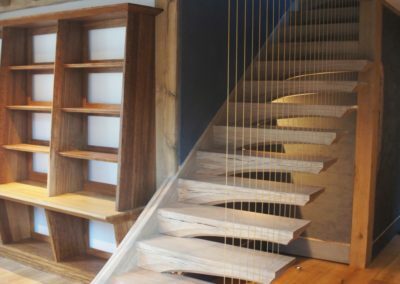 The staircase was carved from large section English Oak for the treads / risers, this design detail helped to compete with the Oak timber frame structural beams the house was made from, the treads then playfully reduced in size and shape in order to allow and share light with in the new corridor space. 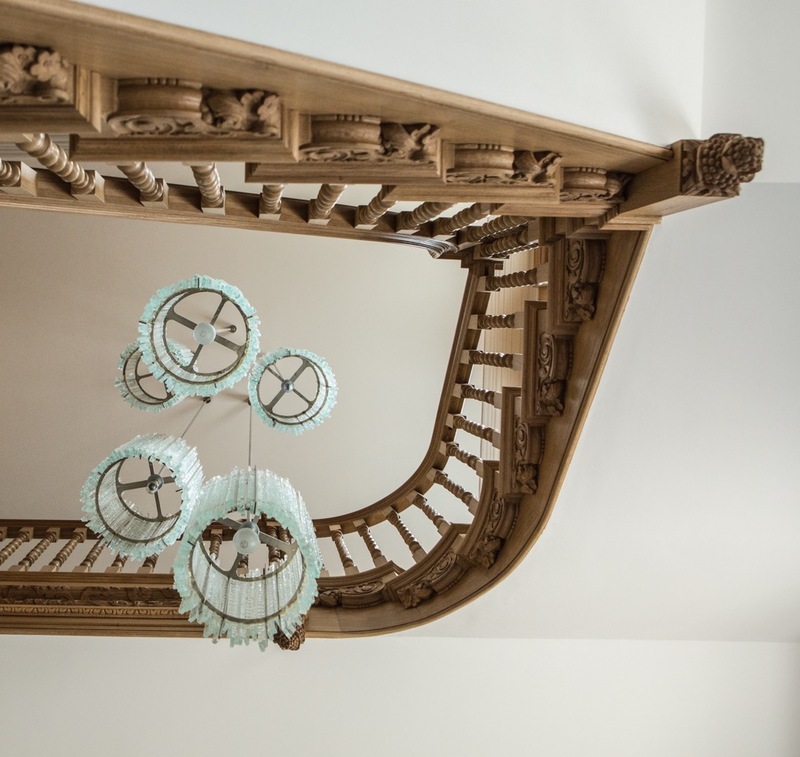 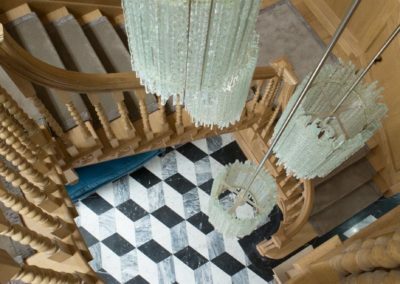 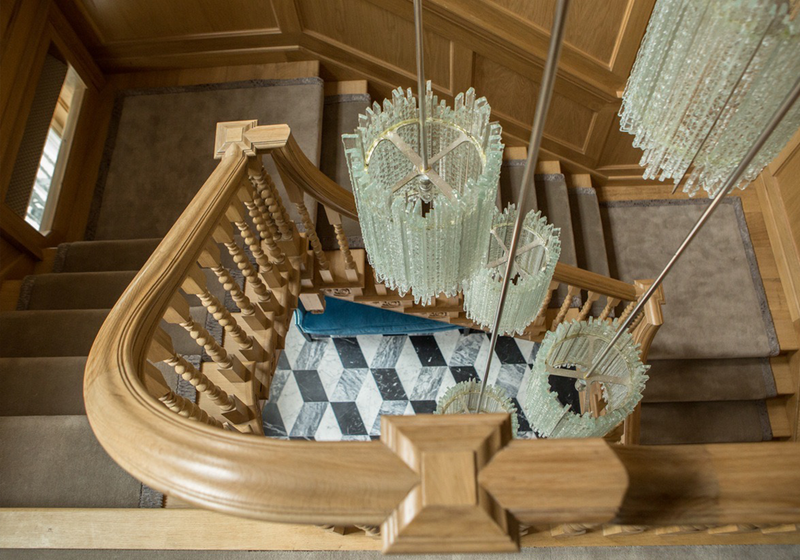 The treads were hung from gold coated wire which were anchored to the stairwell floor beams above, the structural beam work was also crafted by S A Spooner as part of the overall design need. 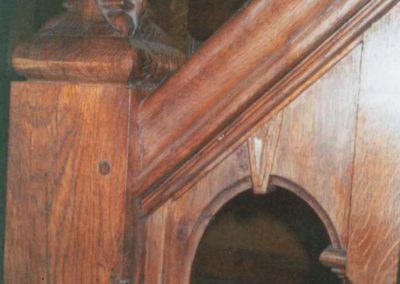 The main staircase was made by “others” and the case originally had a metal spindles as a newel post but gained movement with use. 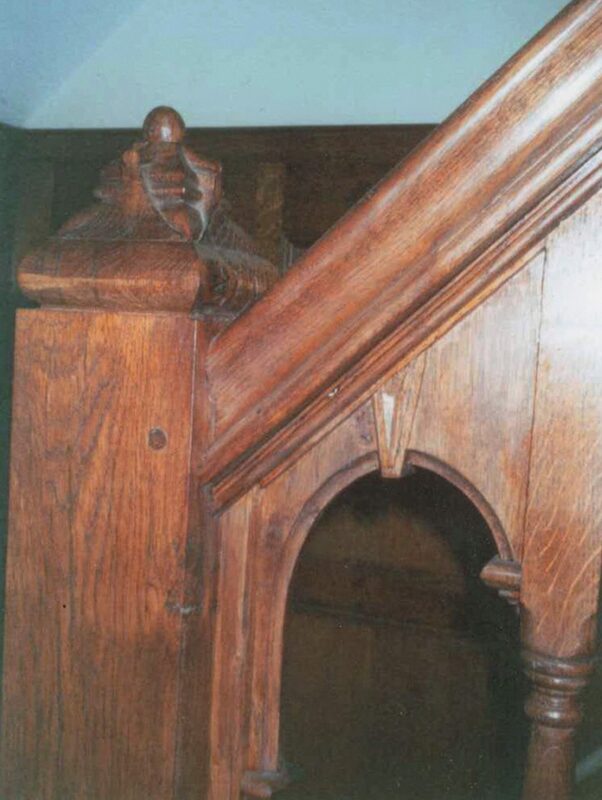 The orginal handrail scroll was machine by C N C made and it looked it ! 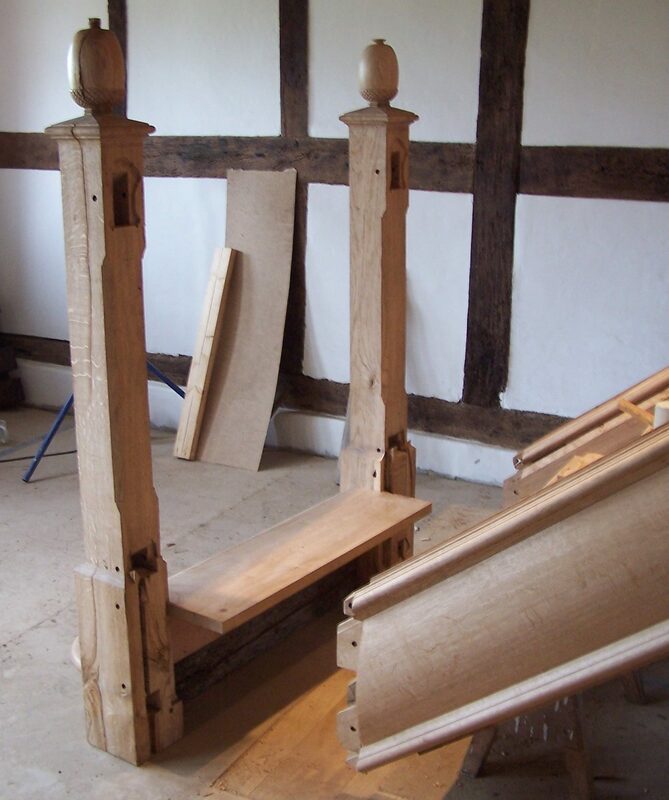 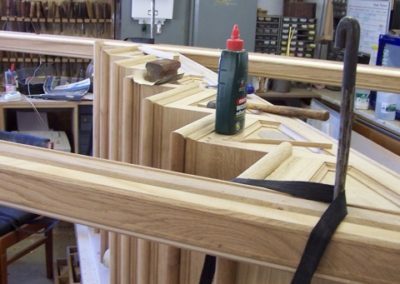 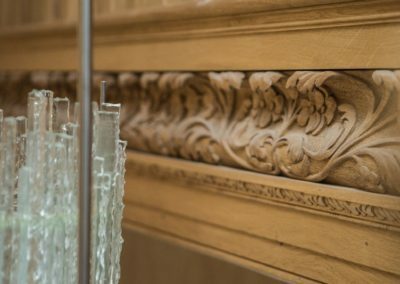 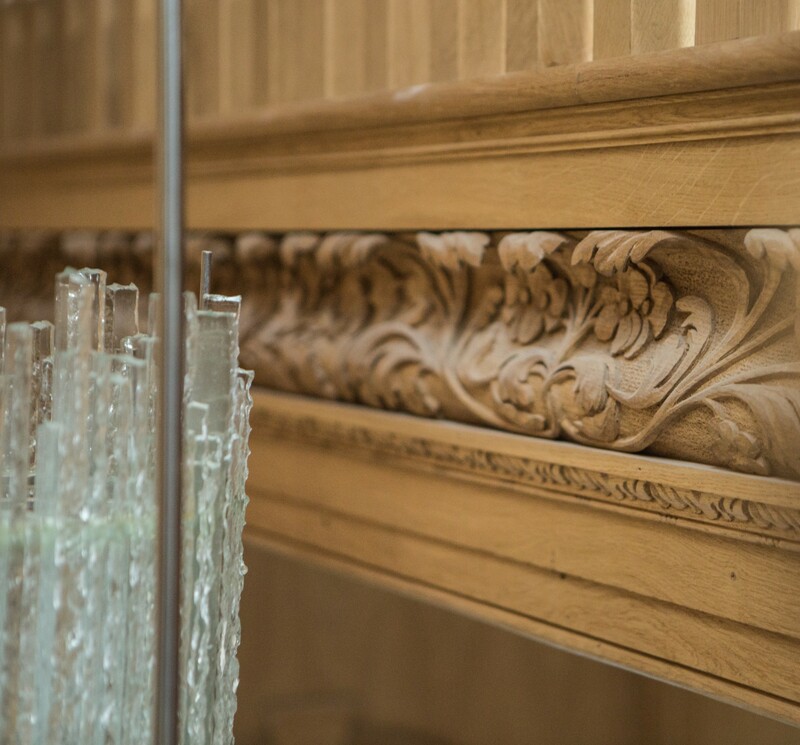 The work involved turning a new post which also hides the metal studding used to make the whole post rigid, the studding nut is used to lock the scroll down and is hidden by the glass ball. 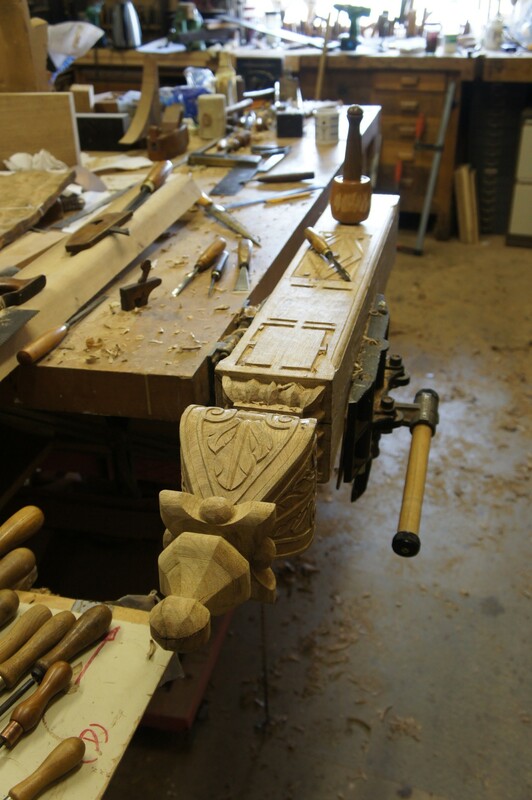 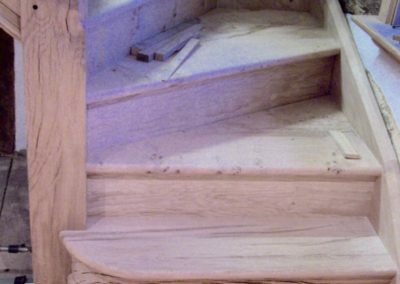 The old scroll was cut off the staircase while clients were away on holiday to reduce disruption and delay,the old scroll was needed in order to give us a true section to match to while carving. 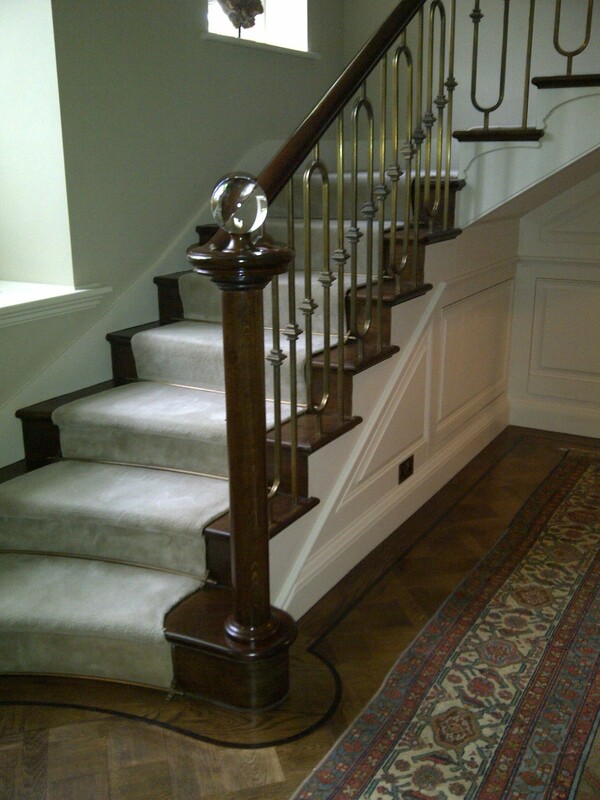 Polished to match on site. 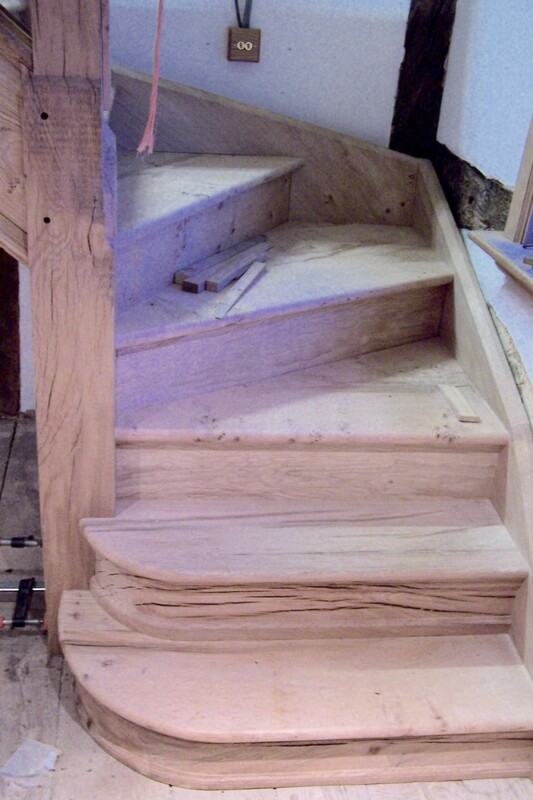 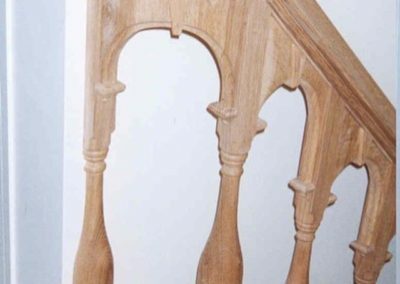 A pair of staircases designed and made for a house dated 1440 located in Sussex. 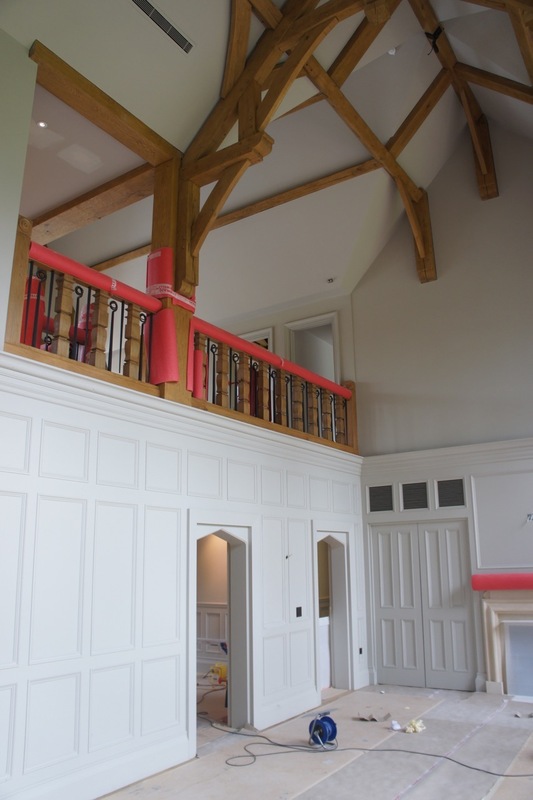 The Joinery and complete project was worked on how the craftsmen of yester-year would of tackled the job. 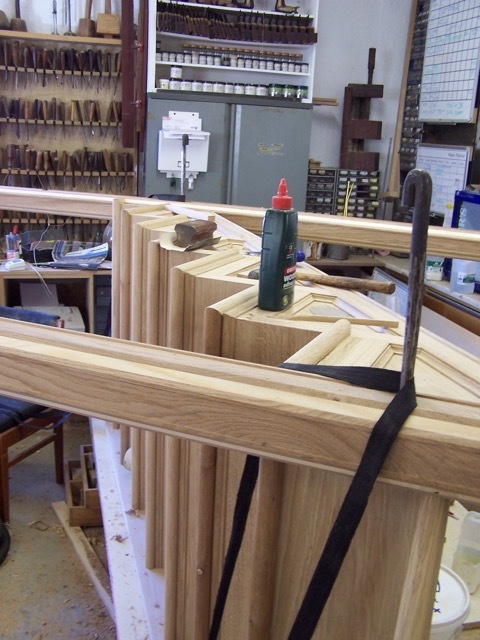 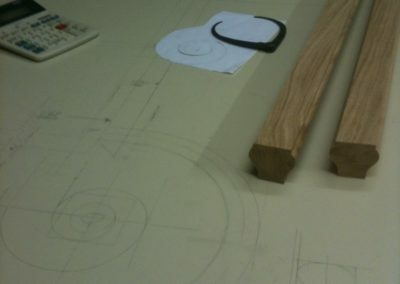 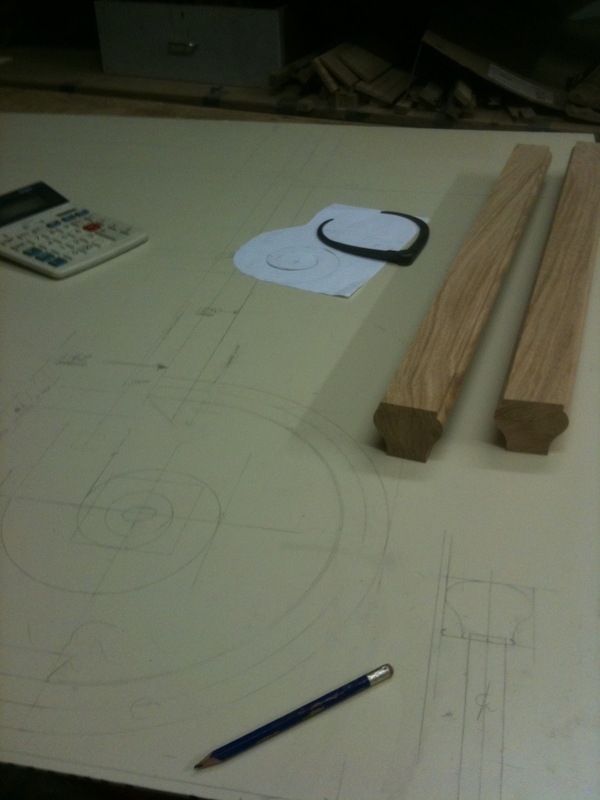 The Oak sections needed to be of a large size in order to be considerate to the scale and the building. 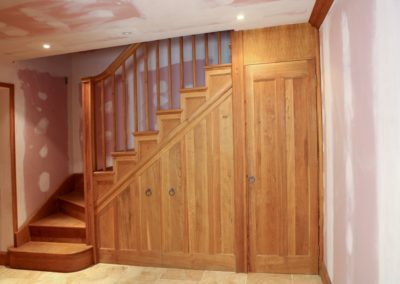 Even though the Oak was air dried stock , it still contained a higher moisture content than would normally be supplied for internal joinery. 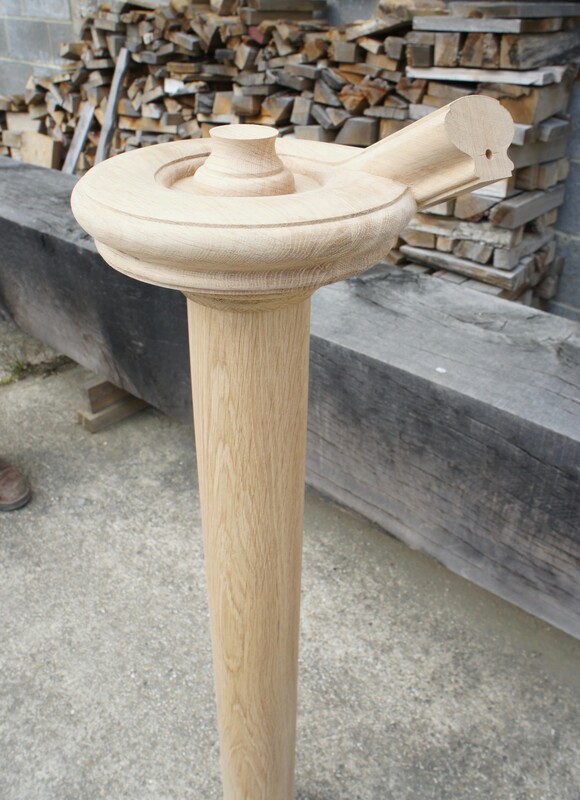 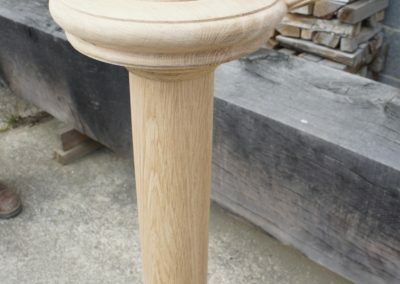 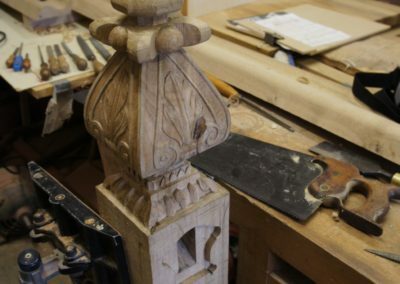 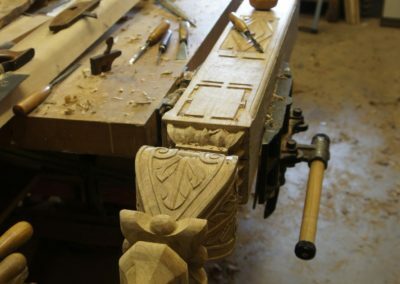 Single large sections would only be suitable as gluing smaller sections together gives a completely different look to a project which is unsuitable and not traditional, small details make a big difference, especially when carved or mouldings come into play and the end grain glows after the chisel has finished with it.